Hi, my name is Ants and I have been building, selling and repairing electric bikes here in Christchurch, New Zealand since 2006. I make and sell all types of e-bikes, from quality commuting bikes right up to top spec, performance off road machines. I also love constructing custom e-bikes specific to customers individual requirements. Off road e-bike rental / electric bike hire for rail trails is available for periods of one week or longer - ideal for campervan holidays enjoying New Zealands rail trails and off road tracks. Please contact me for more information on hiring ebikes. I specialise in repairing all types of e-bikes and their batteries -> all makes, all models. Please scroll down for more details about e bike servicing and repairs. My goal is to get people out of cars and onto bikes ! Contact me to discuss your needs and arrange a free test ride. The Magnum Metro, a beautifully designed, very affordable electric bike. The powerful 48v Samsung battery, reliable rear hub motor, easy step-through frame and the comfortable riding position make this bike fantastic value at $2,899. With hydraulic brakes front and rear and a large 624wh battery, the Metro represents outstanding value and is perfect for both urban or trail riding. This is the mighty Raptor , a beautiful and very capable off road ebike. I have a Raptor and a Forza LTS (step through) available for hire. Both are tough and dependable ! They are powered by a powerful, geared, rear hubmotor and have hydraulic disk brakes front and rear. They are suitable for rail trails and off road use. These off road electric bikes are a great way to see more of New Zealand when on a camper van / RV vacation in New Zealand. Located near the Airport, I hire these off road e-bikes bikes out for a minumim of one week. For more details about off road and rail trail e bike rental, send me an email. If you need your e bike serviced or repaired, get in touch. I service all makes models. I have been trained by Gazelle in the Netherlands to service their e-bikes. I am certified to service Bosch electric bikes and with 12 years experience working on e-bikes I will do my best to repair any ebike. Repairing electric bike batteries has become a speciality for me. I have built up a set of tools and equipment that allow me to charge, load test and discharge whilst measuring the coulomb's flowing in or out. Either of a single cell or of an entire battery pack. This combined with an in depth knowledge of the batteries and their BMS circuitry allows me to be able to resuscitate a battery pack that has been deeply discharged. What do I mean by deeply discharged ? This is often when a battery has been left for a long time (say 6+ months) and now refuses to charge. I also repair BMS circuitry, and chargers. This bike was an e-bike conversion for a customer who wanted assistance climbing the final hill of a 35km commute. It had a 36v 14Ahr Lithium battery pack and an Ezee 300w geared hub motor to allow it to eat hills for breakfast. The internal 5:1 planetary gears inside the hubmotor allow the electric motor to spin fast and produce good power, even when the wheels are rotating slowly as happens when riding up a steep hill. A lot of electric bike motors are direct drive, and struggle to climb hills. 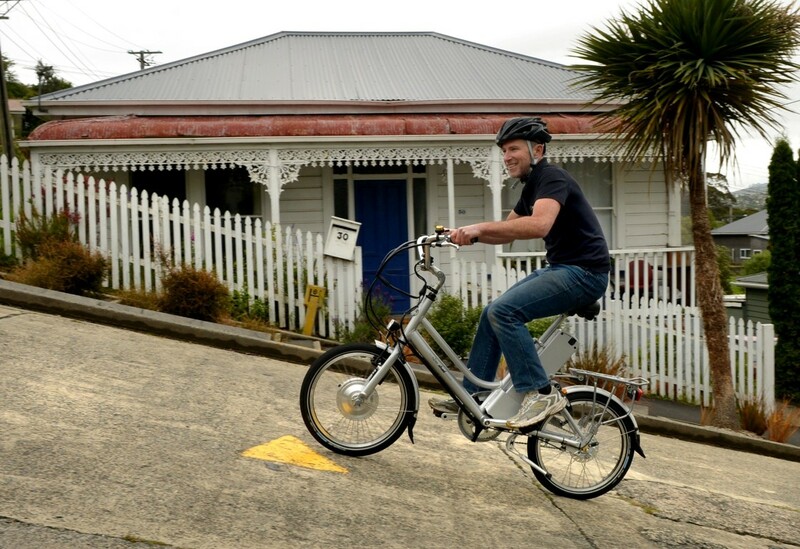 Here is a photo of a 50yr old, climbing Baldwin St in Dunedin (the steepest residential street in the world on an Ezee bike. He climbed it three times that day - thanks to the powerful hill climbing assistance of the Ezee hub motors. Copyright 1997-2018 by Anthony Field on all images/text/information and graphical materials on this website.